Today was a beautiful day at Camp Timberlake! To start off the day Timberlake had french toast sticks and sausages. Right after breakfast the Camp went out to do the morning yell, while the boys gathered together their gear and headed out to the Davidson River to fly fish. During this excursion Aaron H. caught a nice rainbow trout. After doing the yell the boys headed up to chapel. At chapel the boys sang three worship songs, did the Camp Hymn and Matt H. told a true story about how being prideful will ultimately fail you and how you should look upon the one who gives us our gifts, Jesus Christ. After hearing the message the boys headed up to clean their cabin. The scores received in cabin clean up were exceptionally great today! So good that Big Slatty received the second perfect ten of the summer! For the first time in camp history during first and second period campers were given an option to sign out of their classes and go on a Mountain Biking trail ride up on Tomahawk Trail; The campers had a blast! Jack D. continued learning leadership skills by taking the front of the group and telling encouraging words to ones behind him! Andy Leshaw went on his first trip today and got closer to earning his bronze by completing the one trip requirement! During this Mountain Biking adventure the other campers were in their first two activities. During climbing Tyson M. climbed three of the four of the Upper Tower walls while Jack D. mapped out a route on the boulder at the Upper Tower. In Swimming Charlie B. should himself to be a very proficient swimmer! At fencing Damian U. won a fencing match and continued to improve on his blade work and foot movement. In Backpacking Seth H. got his bronze, Nico L. received his silver, Victor A. and Grant H. added to his knowledge of backpacking by building a fire from scratch on his own for the class! Finally during second period Christian S. had a sweet game winning goal in the wonderful game of Wonderball! For those who are asking the question, “what is Wonderball?” Wonderball is a combination of soccer, ultimate frisbee, basketball and a hint of rugby minus the physical aspect. After the first two periods the mountain bikers finished the trail and all the campers had fifteen minuets to prepare for lunch. At 12:30 the eaters bell was rang and Dan started the Adam’s Family prayer (this prayer is sang) then blessed our food. Pizza was served at lunch which caused a frenzy because pizza is one of Camp Timberlake’s favorites. After everyone ate, cabin scores were announced along with the Seminole’s victory in last night’s upper cabin evening activity, Wonderball while in the lower cabins Iroquous won last nights activity Battleball! Right after lunch the campers and staff headed up to the best time rest time! This translates to a rest period of thirty minuets. After Rest Time the campers head down to the Trading Post to get their favorite candy and drink. This may vary from a Sprite to a Milkyway. After Trading Post activities were opened up for campers wanting to get their bars in their activities. Today in Climbing Baily Martin climbed the boulder working on the silver route. During Free Time Dan N. also lead a work out session in the Mike and Big Piney played with Camp’s new Laser Tag guns in the Trading Post. After Free Time Third and Fourth Period opened up! In Rocketry Andy Leshaw got closer to earning his next bar in Rocketry. During Archery George H. showed improvement in his technique. In wrestling both Patrick and Brandon P. demonstrated a great double leg takedown on an opponent. In Paintball and Airsoft there were some entertaining games were played by the campers! During Soccer and Team Sports the two activities combined together and formed three teams and played Wonderball. In the game Bow Adams’ showed off his goalkeeper abilities by blocking some well placed shots on frame. JB G. vitalized his athleticism and helped score some crucial goals. Harris C. almost scored some two pointer and overall the two classes had a great time playing! It was also a great day in Swimming! The weather was great, attitudes were awesome and the campers had a good time during learning new skills and free swimming! In guitar Davis taught his class basic chords and Jack W. step towards his next bar in his class, Archie D. did well on bar chords, while Dane T. got closer to getting his Gold bar in guitar! After third and fourth period the campers are given thirty minuets before dinner. 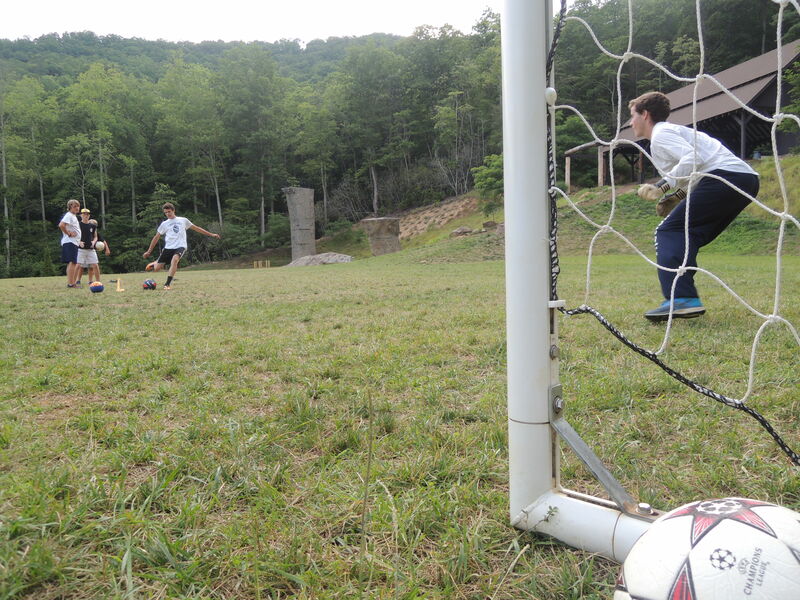 A group of campers threw the football outside the dining hall while Harris C. and a group of campers played several Tetherball matches by the Trading Post area. At 5:00 the eaters bell rang as the campers filed into the dining hall. After singing the superman prayer and Dan praying for the meal the room got louder as the campers excitingly yelled and screamed because the lovely kitchen staff made them chicken and mashed potatoes! After stacking up the dishes and the councilors bringing them to the pass-through window and the staff announcements about trips going out in the next few days Matt H. rallies up the campers about the evening activity and announces Inferno!! After the Evening Activity Greybeard went to Poker Night in the Enchanted Barn, Both Slatties’ went to a free swim and water polo, Stompers Knob went to put the puppies to bed and Tomahawk played laser tag! Following the post evening activities all the campers head up to their cabins to get ready to bed, socialize with cabin-mates and to hear a devo based on the chapel’s message and get get a good nights sleep so that they can be fresh for the next day!